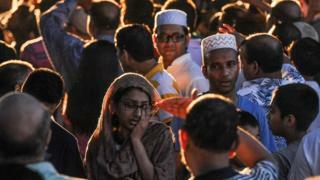 An imam and his assistant were shot dead as they walked along a street in the New York borough of Queens. "He would not hurt a fly," Imam Akonjee's nephew Rahi Majid, told the New York Daily News. "It's really threatening to us, threatening to our future, threatening to our mobility in our neighbourhood, and we're looking for the justice." "I understand the fear because I feel it myself. I understand the anger," said Sarah Sayeed, a member of New York mayor Bill De Blasio's staff who works as a liaison with Muslim communities. "But it's very important to mount a thorough investigation." US election 2016: What does 'Islam' think of America?